Taking a little care of the teak wood can extend its life almost tenfold. In result the furniture would become very durable. Moreover taking care will also ensure that the natural shine and gloss of the furniture will be enhanced and last for longer duration. Some of the methods used to take care of teak wood, cleaning it and maintenance are as follows. 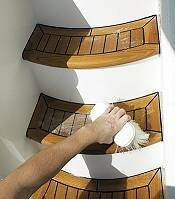 Washing teak would be possible with mild soap and water mixture. Such washing should be carried out using soft utility brush. The brush will be used to remove dirt and dust from the surface. After dusting the furniture will be rinsed and then dried completely. Teak furniture should never be scrubbed or polished heavily. Both the operations should be carried out in a soft and sustainable manner. No wood sprays, preservatives or oils are required for maintenance of teak wood since it contains natural oil in it. Only when the wood becomes older and develops grey and rustic color, oil could be externally applied to make its features smooth. Application of oil in teak can make it shiny and also extend its life span. 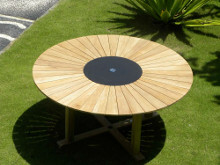 However, it is necessary to take care of certain aspects while applying oil on teak furniture. Surface of the furniture should be clean and free or dust or dirt. Only true teak oil should be used instead of any inferior quality products. In case of patio furniture teak oil should be applied before the furniture starts weathering. Before application of oil, the furniture should be completely dried out. Normally such precaution is required when there is rainfall. Usually it takes around 48 hours for the furniture to dry up after rainfall. It is important following the instructions on the teak oil packaging provided by the manufacturer.